NOTE: A compilation of “When I grow up, I would like to be a…” by my three boys through the years (pardon the quality of the photos; super old collections). Big house. Firstborn approached me and related his evening conversation with his youngest brother. Son: Mama, Bunso told me he wanted to be a doctor when he grows up. I remember my dream. I used to dream of becoming a bus conductress. She can stand still even when the bus is moving. And that was my ambition at age six. Second son’s teacher approached me and showed to me my son’s writing composition. The graduating preparatory students were asked “what do you want to be when you grow up?” for their yearbook. “I want to be a street fighter,” was his proud answer. Two years after, second son still dreams of becoming a street fighter. “I want to be a civil engineer when I am a big boy na, mama. And I will build this house for you,” says my five-year-old loving Bunso. 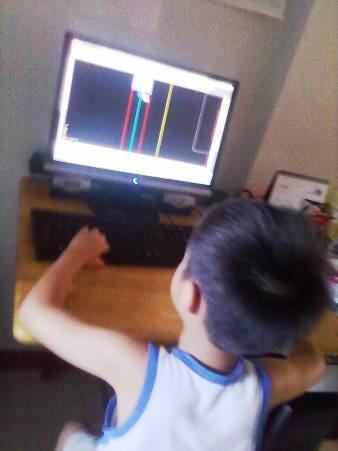 THE YOUNGEST AUTOCAD ENGINEER at age 6. He is our Bunso and he often watches his papa work on the computer. From time to time, he would ask his father what the color signifies or what the different thickness of steel implies. He is one curious kid. Last Friday, as his father excused himself for a few minutes’ rest, Bunso asked his father what he will do next. “I need to erase all the doors and windows from the file,” the father said matter-of-factly. This is our Bunso trying to finish his papa’s work. And he did it perfectly. As in! Today, I learned that my Bunso doesn’t what to be a doctor anymore. He wants to be an engineer. On his book, he describes that as an engineer he should have power tools and construction equipment to finish his project. When I grow up on TEACHER OR ENGINEER? The second son had take-home test papers for checking. He told me his teacher requested him to check his classmates’ Science quiz. Bunso: Huh, kuya Second son, you are like a teacher. Checking papers! Second son: Yes, but I still want to be an engineer. When I grow up on BEING HAPPY. “I just want to be happy when I get old,” the nine-year-old boy added. Then I remember what John Lennon’s ambition in life was. Children have the funniest and even the most profound yet most sincere sayings. I just thank God for blessing me with such amazing boys. Aww. I remember when I was so tiny, I would really say that I want to be a pianist when I grow up. Not just a person who plays the piano but a concert pianist! I watched a concert pianist when I was smaller and it ignited me to push music all throughout until high school. I just stopped when I went to college. Ow why? Perhaps when you see a piano again, the desire will be back. But then, whatever you want to pursue, surely you will succeed. I always see that drive on you. Wow, I truly enjoy reading your blog post. I remember my ever first ambition when I was asked by my teacher. He asked me what do I want when I grew up, I smiled back and said I want to become a Doctor. I wish I received a chance to study medicine, but I didn’t. Your son is very smart, I can say that, he seemed to be very curios in almost everything. He’ll certainly have a long way and a good future. He might be a famous Engineer soon. Thank you for the kind words. I also pray that he be successful and happy always. Whatever he wants, I will be at his side to support and encourage him. But more than anything, I want him to be happy. I believe it is never too late to be a doctor. You can still pursue it if it is what your heart desires. This is an interesting read. Made me remember my childhood dream. All i wanted to be when i was in elementary was to become a CEO of my own company, sign papers and checks. Then when i went to highschool i wanted to become a flight attendant! As in i really wanted to dress like one kase i wanted to travel around the globe. Then in college i ended up taking nursing which after passing the board, i realized i dont want to work in the hospital neither go abroad.. haha! Now i am focused with a small business and im happy and contented about it, basically bcoz i have kids and i cannot imagine success and profession without them..they are my priority.. things really change when u become a mom noh? I agree. But it seems youve fulfilled your dream when you were in elementary. You are the CEO of your own company. Galing! From time to time, I also ask my son what he wants when he grows up. He wanted to be a chef when he was in preschool but now he wants to be a firefighter. One time, he wants to be like me. I said no, you need to work, di pwede househusband. hehehe! hahaha. so cute of your little man. There are really different things that changes when we grow up. The things we wanted before were completely different now. Same with your boys. Just so cute to hear them answer like they just want to be happy. haha. Yes, sometimes they tend to want to be like that because it is the fad or because they feel inspired by a certain person. Nonetheless, they are always cute. Aw. thanks for the nice words, Momma Michelle. I do hope he will be happy with his chosen career. And I will wait for that beautiful home. Ihihi. Awww! Let their dreams motivate them! 🙂 When I was a kid, I used to want to be everything all at once: a chef, a writer, a painter, a lawyer, a businesswoman – just everything. Honestly, I STILL want to be all those things, and I’m on the path to doing that, sans the lawyer and chef ones haha! Sweet, sweet kids! My 7 year old is pretty made up, he has been consistent since age 2. He wants to be a police man or a soldier. We brought him to PMA last year and his grin was the biggest I have seen ever, when he saw cadets march in cadence. What an intelligent little 9-year-old one !!! When I grow up , I want to be happy ! He now already understands life much better than most adults ! Children are so honest and funny , that was a nice piece of reading ! I love your posts , it makes me always smile and giggle to read what your gorgeous kids come up with ! This reminds me of my little brother. He also told us he wanted to be a baker when he grows up. And we all thought he had forgotten all about it after being a basketball player; but then he suddenly took up Hospitality Management in college, and changed majors from culinary arts to pastry! Now he bakes cakes, breads and as perfect as it used to be, more improved actually. He is kind of like your bunso. He was the youngest baker I know too at the age of 6. He baked his first bread with dough, and by the time he perfected the bread, he decided to create his own recipes with pandan bread, etc. I was his tester hahaha. When I was a child I had a lot of dream to become like almost every year. As far as my memory is concerned I once dream to become an army, a horticulturist, a chef and an artist. But in reality, I end up being an educator. I commend your son for having a clear vision of what he want to be. Awwww. I love how you’ve documented every step of your child’s dream. Dreams change even after graduation but I’m glad and I strongly feel that you’re going to be the best and most supportive mom ever. God bless you and your child 🙂 I hope he reaches his dreams. I remember Nate, people in the church were teasing him that he’s going to be a pastor when he grows up. He would yell at the top of his voice and say NOOOO! When I asked him if he wanted to be an excavator driver, he immediately responded YES! haha. Ano kaya magiging career talaga nila paglaki no? My own children had different dreams of what they wanted to be when they were younger. As of this time. they haven’t really decided yet but I will support them whatever their choice are. Their dreams do change as they grow up. Hmm..my boys right now, it’s more of wanting to be a doctor. My eldest even does the task of taking his grandfather’s BP every night. The battery operated kind though. Haha. Feel na feel niya ang pagiging doctor. There was also one time, I want to be a daddy. Period. Haha! Hihi cute! My son naman wants to be an astronaut for now. I wonder what he will want to be next! I think it’s important to encourage them to aspire and work for what they want. Awww this is so cute! I’ll take note na rin of what my son wants to be when he grows up. When I was young I wanted to be a cashier! How adorable! I remember when I was a kid I really wanted to become a dentist, then doctor. But took IT in college. It’s been 6 years since I graduated and I want to become a teacher. Lol. Not too late to pursue that though. By now I know that most kids change their minds a lot in terms of what they want to be when they grow up. My five-year-old wants to be a fireman daw when he grows up. Let’s see what he will say in a few year’s time. Hehe! My son’s dream job is to be a driver or construction worker. I know it will still change so whatever he likes to be when he grows up we will support him. I smiled while reading your post, mommy. 🙂 It’s amazing talaga how a child’s mind works no? It’s admirable that even at such a young age, your son already has a grasp of what he wanted to see of himself in the future 🙂 When I was a kid, I wanted to be a reporter after watching them on TV, covering the typhoon news, basa in the ulan and all. Your brother is indeed so cute!!!! I’m impressed you were able to compile these things. You gave me an idea to do this as well. My first ambition was to become a seamstress because my lola is one! And then came a series of ambitions from teacher to pedia to broadcaster to a nun (i entered a convent when i was in high school, for real) to psychiatrist to lawyer to journalist. Aaahh, That’s so cute and sweet. Usually the bunso is the most loving and sweet among other siblings and yours is the perfect example. Hehe. I can’t wait tuloy to ask my son when he grows up a bit more of what he wants to be when he grows up. Surely when you ask him, you will cry or perhaps smile and even laugh. They can be so imaginative and ideal and so brave to speak their mind. When I was young I wanted to be a teacher! Nag aaral aralan pa kame, yun yung usual na laro namin. Eh ang kukulit ng mga estudyante ko so hindi na lang hehehe Eventually as time goes by, nag iba na din yung gusto ko. Its so much fun hearing our sons about their ambitions ano? Ako medyo matagal tagal pa but I am so excited to hear what are their ambitions are. hahaha. he doesnt want to be a street fighter now. Hahahhaa. Now I would want to recall what I wanted to be before. Kids really have the funniest ambitions when young. But, yours was the funniest. That’s a nice career. But, I’m happy it changed overtime. Lol. I think it’s healthy for kids to have changing aspirations. My daughter once told me Mommy, bakit ako, wala pa akong madecide? and I told her na kasi she’s still discovering herself. It will come and although parents will always wish to make the kids get their goals, pano kung hindi pa nila alam kung ano ang goals nila. So we just have to wait and guide them along the way. Don’t you just love it when they set goals in their lives so early? We all start at believing we can conquer anything. 🙂 My 5 year old wants to be a horse, hehehe.